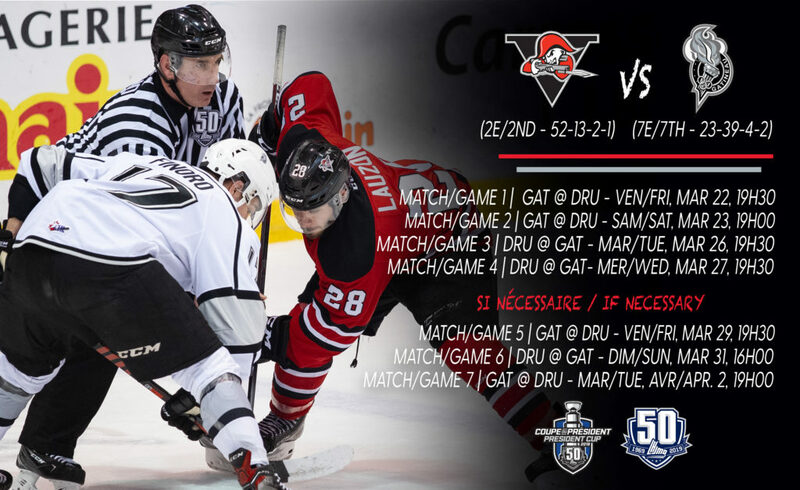 A combined 83 seasons of history will clash in the opening round of the 2019 President Cup Playoffs when the Drummondville Voltigeurs take on the Gatineau Olympiques starting this Friday at the Marcel Dionne Center. The Central Division Champion Voltigeurs finished the regular season second overall in both the Western Conference and the league overall. Their 52-13-2-1 record and 107 points represented the best result for the club in 10 years. Conversely, the Olympiques finished seventh in the Western Conference with a 23-39-4-2 record and 52 points, its lowest point total since 1984. The Voltigeurs are looking to build off their 2018 playoff run that saw them reach the league Quarter Finals for the first time in four years. After defeating the Cape Breton Screaming Eagles in five games during round one, the squad would have the tables turned on them by the Victoriaville Tigres in a five-game second round defeat. The organization has appeared in four President Cup Finals since its inception in 1982, losing out in 1986, 1988 and 1991. They would capture the league title on their fourth try in 2009, defeating the Shawinigan Cataractes in seven games. The Olympiques organization and the QMJHL playoffs are synonymous. The franchise has appeared in the postseason a staggering 35 times in a row. In that timeframe, the club has appeared in 10 league finals, won a league-record seven President Cups (1986, 1988, 1995, 1997, 2003, 2004, 2008) and earned a Memorial Cup victory on home ice in 1997. The last championship series appearance for Gatineau came in 2011, when they fell to another eventual Memorial Cup winner, the Saint John Sea Dogs. Despite the 55 disparity in point total during the regular season, the Olympiques were one of the few clubs to notch two wins against the Voltigeurs in 2018-19, the most recent one occurring on January 29th in Gatineau, when Gabriel Bilodeau’s overtime winner gave Creed Jones the victory after the latter turned aside 33 shots in a 4-3 win. The Voltigeurs took the other four games in the season series, including a 7-0 decision at home on March 10th that saw winger Gregor MacLeod score twice and add an assist while five other players recorded multiple points. The Voltigeurs possess a vaunted offense; their 338 goals for are the most scored by any team since 2013. 2018 Detroit Red Wings first rounder Joseph Veleno led the charge with 42 goals and 104 points, both team highs. Veleno was one of five 30-goal players on the club, including teammate Maxime Comtois, who recorded 31 goals and 48 points in only 25 games after spending the start of the season with the NHL’s Anaheim Ducks and then captaining Team Canada at the 2019 IIHF World Junior Hockey Championship. On the blueline, it was 2018 Chicago Blackhawks first round selection Nicolas Beaudin (56 points in 53 games) who led the charge. At the holiday trade period, he was joined by another NHL first rounder, 2017 Arizona selection Pierre-Olivier Joseph. Between the pipes, Edmonton Oilers prospect Olivier Rodrigue tied for the league lead in victories with 35, while his 2.43 GAA was good for second in the circuit. When Rodrigue went down to injury in early March, veteran Anthony Moronne stepped up to go 5-1 in his absence. The Olympiques, who regularly featured upwards of 12 first-year players in their lineup on any given night, were led on offense by overage center Giordano Finoro (27 goals, 51 points). Another 20-year-old, Bilodeau, found himself ranked tenth in scoring among all “Q” defensemen with 48 points. Electing to focus on a youth movement during the holiday trade period, the Olympiques made a key acquisition in 17-year-old center Mathieu Bizier from the Rimouski Oceanic, who registered 27 points in 35 games following the deal. The goaltending tandem of Jones and rookie Rémi Poirier combined for 15 victories, most of which occurred after previous number one netminder Tristan Bérubé was dealt to the Oceanic in the deal that brought the aforementioned Bizier to the Olympiques. Regular season superiority notwithstanding, the Voltigeurs will need to overcome a key element in order to advance past the Olympiques. That would be history. The two clubs have matched up in the QMJHL playoffs eight times. The Olympiques organization has emerged on the correct side of the series result each time. This includes two President Cup Final encounters in 1986 and 1988. The most recent postseason encounter between the two longstanding rivals occurred in 2011, when Gatineau emerged victorious in a six-game Quarter Final series.